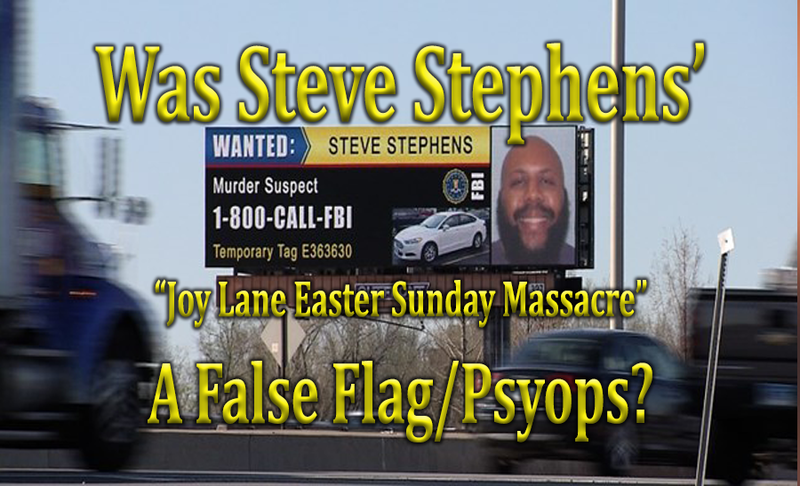 Was Steve Stephens “Joy Lane Easter Sunday Massacre” a False Flag/Pysops? “To all you people that fell in line for this little facebook killer story… I just looked up and found TEN different gun murders that happened between Sunday and today in the United States. Now ask yourself, why was the country made to get worked up over THIS one incident? And if the killer killed himself, Why? The old man was random right? So, what did he accomplish? Don’t killers have motives? But don’t stress your brain to much thinking about that, stick to this one thing…. This was streamed on social media the day before the Cleveland fiasco. There were a few more that were streamed on facebook live that I could show you…but it’s not necessary. 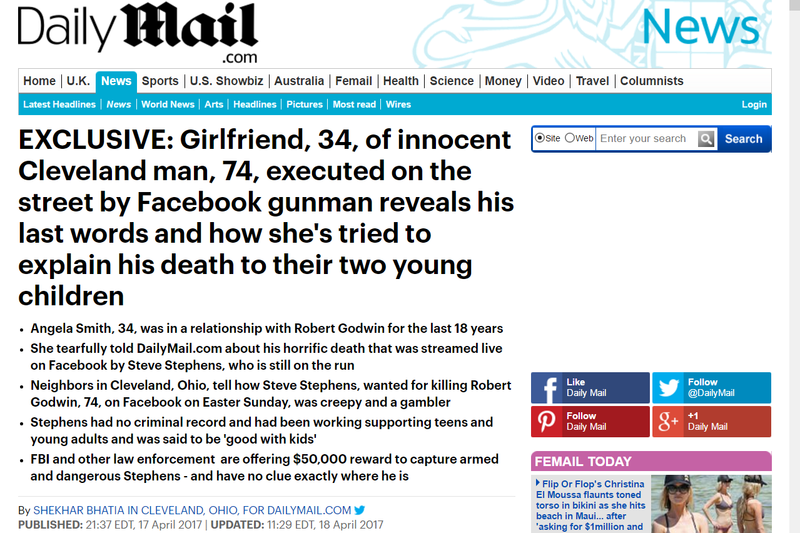 I’m just wondering why the Media choose to ONLY broadcast and cover the Cleveland situation when so many more murders went on in that 3 day period AND they were being streamed. There were 42 people shot in Chicago the same day the Cleveland situation went on. What’s going to happen is they are going to get it to the point to where you can’t live stream these cops going upside Black people’s head soon. But either way it goes, you need to realize you are being played and directed by puppet masters. “Video was just released showing the senseless murder of a young man in Brooklyn. NB COMMENTARY: I think and this is just my opinion and gut feelings, the media is given a script, an angle, a perspective. They are parrots for the agenda. If you look into it, you will discover that the CIA has infiltrated the MSM. The story is already written, that’s why they sound like mocking birds. Now, with that in mind, remember this. They need to control the narrative. Random deaths and killings they cannot control. However, they can control the staged ones. They can also set their actors in place, camera men, narratives, etc. like a movie script and then they can release it to the public. The repetition of the story shows how the narrative was designed. Now, they could very well pick anyone to play the roles. But typically they choose folks in situations who have criminal records, or something in their history or maybe a looming court case to use as patsies. Whatever the case may be, you can tell by the lack of affect that it’s all staged. Mike Brown’s Mom, was clearly upset at first, then we find out later, her husband was a Mason. Trayvon Martin”s Mom endorsed Hillary Clinton. You see? They create a Web of complicit characters so they can control the narrative and in most if not all cases control the minds, thoughts and feelings of the masses. The other killings were Not selected to be part of the narrative or, as some would call it, a false flag/psyops. I think the reward thing is based on many incidentals. Since he was not tried and convicted of the crime, I think is one of the stipulations. How many people have you found to be rewarded instantaneously for finding or reporting to have found some criminal. Rewards, Bonds, etc. 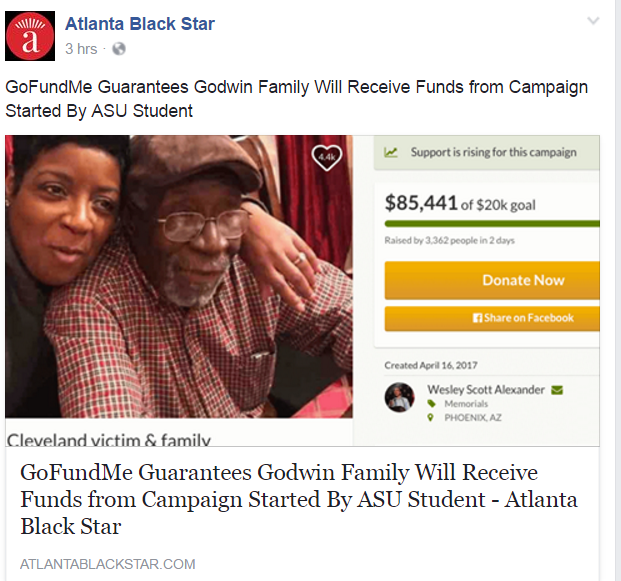 are all like GoFundMe. they collect the money or the promise and then they bet on it on the stock market. Just like anything else. Even a lawsuit, when they start throwing numbers around, the gamblers down Wall Street get ta moving. Think about it, where on God’s green earth did anyone receive a lump sum of money at one time. No way. They gotta play with that money down Wall Street. Folks don’t just bet on stocks, they bet on the social security fund, the pension plans, the donations to non-profits after a Natural disaster, heck they bet on natural disasters. Think about it, how many hands get in the mix when there is a reward, donation or lump sum of money “offered”? Think about the logistics and the sweat equity. So I believe it was three organizations that gathered the reward together. They can write it off and/or insure it. McDonald’s Owner Explains How Employee Helped Police Find Steve Stephens!